From their professional lives to their hiking adventures, the owners of Munk Pack were looking for products that were minimally processed, with real, wholesome ingredients. This business started out in the kitchen, funneling homemade oatmeal and fruit smoothies into bottles, and then into convenient, BPA-free pouches with their Oatmeal Fruit Squeezes. 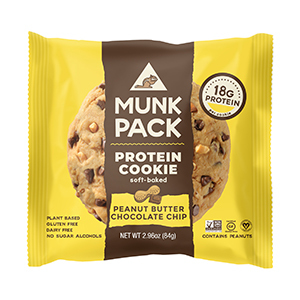 Embracing this commitment to bringing only high-quality, delicious products to the market, they have now expanded their product offerings to soft-baked, power-packed NEW Protein Cookies! A functional alternative to energy bars, these cookies contain 18G of plant protein, are a good source of fiber and on average contain about half the ingredients of other similar products. 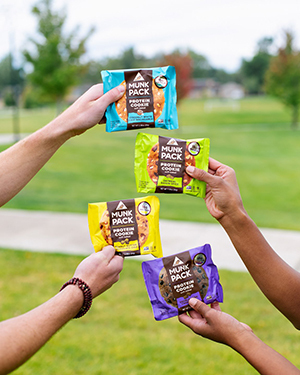 Munk Pack takes pride in creating better-for-you snacks that taste great as well as cater to a variety of dietary lifestyles and nutritional goals! 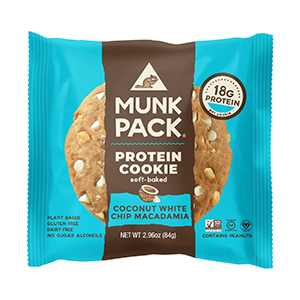 In each bite of this Coconut White Chip Macadamia Protein Cookie, you will enjoy a tropical mix of coconut flakes, vegan white chips & crunchy macadamia nuts. Each Coconut White Chip Macadamia Protein Cookie contains no sugar alcohols, no gluten, no soy, no dairy and no eggs. Chocolate lovers, this one’s for you. 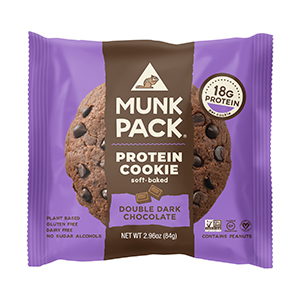 This Double Dark Chocolate Protein Cookie lets you enjoy the decadent and rich chocolate you love, but with 18G of protein for a better-for-you sweet treat. Each Double Dark Chocolate Protein Cookie contains no sugar alcohols, no gluten, no soy, no dairy and no eggs. There’s few flavor combinations as classic — or as delicious — as peanut butter and chocolate. They’ve packed 18G of plant protein into this Peanut Butter Chocolate Chip Protein Cookie to keep you fueled and feeling good on the go. Each Peanut Butter Chocolate Chip Protein Cookie contains no sugar alcohols, no gluten, no soy, no dairy and no eggs. 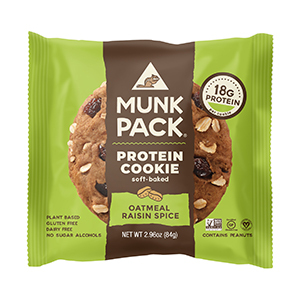 This Oatmeal Raisin Spice Protein Cookie mixes the beloved oatmeal raisin cookie with cinnamon, nutmeg and plant protein for a yummy snack that tastes just as great as it makes you feel. Each Oatmeal Raisin Spice Protein Cookie contains no sugar alcohols, no gluten, no soy, no dairy and no eggs. Your favorite cookie just got a protein-powered upgrade. 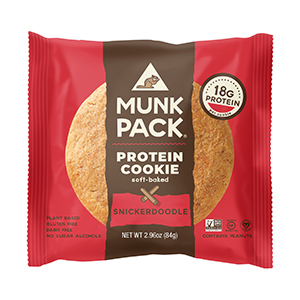 The Munk Pack soft-baked Snickerdoodle Protein Cookie is chewy, coated in cinnamon and sugar crystals, and nutritiously packed with 18G plant based protein and 6G fiber. Each Snickerdoodle Protein Cookie contains no sugar alcohols, no gluten, no soy, no dairy and no eggs.